2. Cultivating a culture of concerned citizens in Chappaqua across all generations. Hometown advocacy groups for Hillary were established even prior to her official announcement to run for President. 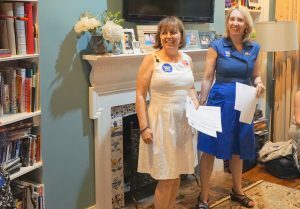 These Hillary supporters from groups such as Chappaqua Friends of Hill (and Tim) have local members that span across all age groups and are involved in activities such as canvassing and voter registration near and far. Many of these supporters have never been involved before in political advocacy but felt inspired by her. Chappaqua 4 Clinton/Kaine NOW offers a steady stream of campaign news on Facebook and Twitter. 3. Increased media presence. Last month, when Hillary Clinton abruptly left a September 11th ceremony, it was later announced that she had pneumonia. For several days, several TV crews were camped outside Walgreen’s on King Street and her Old House Lane residence hoping to catch a glimpse of her. There’s no doubt the media will be back in town on Election Day to secure footage of her and former President Bill Clinton voting at their polling place, Grafflin Elementary School. The good news is that most likely the media presence will be short-lived and will only be palpable when she is in town. 4. Enhanced notice of our downtown merchants. There’s a definite “up side” to all the media exposure. 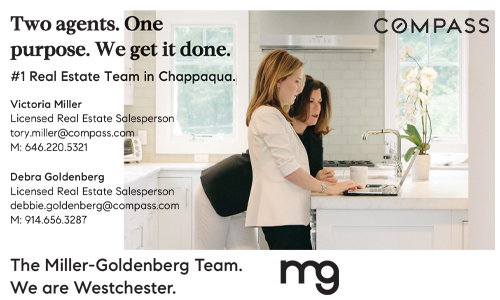 “Seeing Chappaqua’s store fronts on a national TV newscast or in a top daily newspaper is not only thrilling for all of us who live and work here, but it serves as a very effective means for promoting our town and its businesses,” noted Dawn Dankner Rosen, president of the Chappaqua-Millwood Chamber of Commerce. 5. 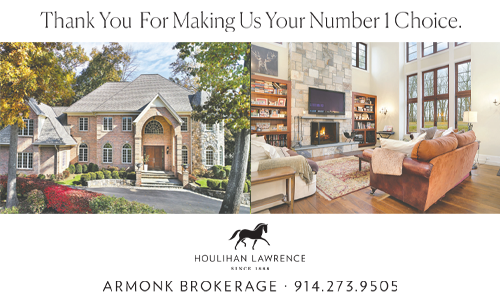 Warm welcomes from the community when they are back at home. “When Hillary becomes president, I’m sure the duties of her office will keep her in Washington and abroad even more than before. 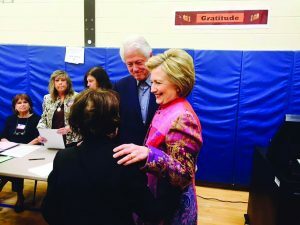 And when the Clintons find themselves back in Chappaqua, they will be warmly welcomed, as they are now,” said Robert Greenstein, Town Supervisor. Gray Williams the town historian agreed, noting that “the Presidency is an ephemeral thing” lasting eight years at most and that the couple’s White House duties will keep them traveling a lot. 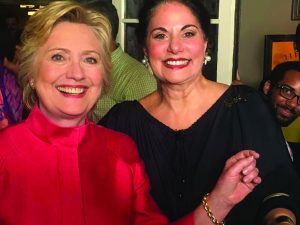 With Varda Singer, owner, ICD Contemporary Jewelry, during an impromptu party at Crabtree’s Kittle House to celebrate Hillary Clinton’s historic nomination. 6. 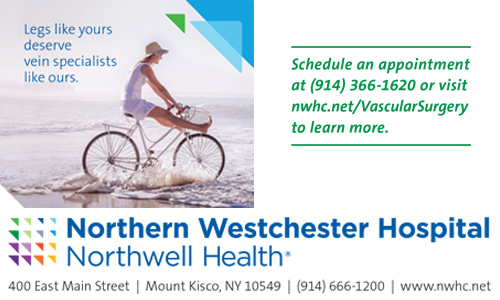 Occasional traffic issues/road closures. When Bill Clinton was President, he occasionally used the Westchester Airport. As a security measure, the roads were closed so that his motorcade could pass through. Chief Ferry of the New Castle Police noted hat the department would help with “traffic flow” and residents can expect that from time to time Hillary may also use the airport. The police department has put additional funding in the budget for additional officers for next year to help assist with this and Ferry noted that when Bill was President much of this funding was actually reimbursed by the Federal Government. Additionally the police department recently changed Old House Lane and neighboring Green Lane to “local traffic only” streets as a security precaution. 7. A huge impression on our younger residents. 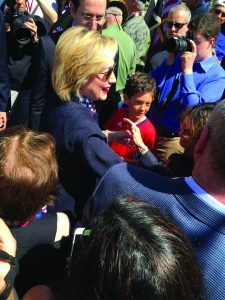 The cover story essays in this very edition offer a sense of how Hillary’s “first woman nominee” status has impacted the imagination of younger residents, especially girls,” noted Bennett. “Her influences on all our childrens’ futures is absolutely phenomenal to consider, too. You can never underestimate the ripple effects of a broken glass ceiling! 8. A sense of permanence. 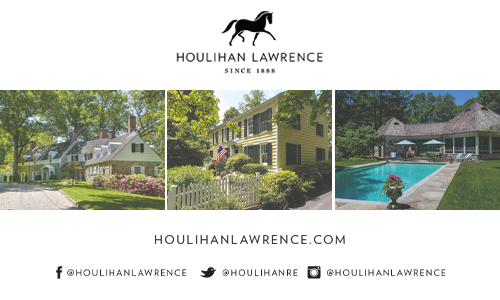 The recent purchase of the house next door to the Clinton’s current property is ample evidence of a commitment to Chappaqua from the Clintons for the foreseeable future. 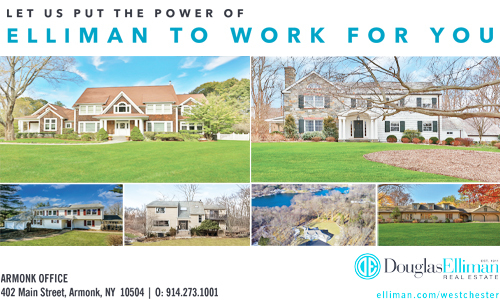 News outlets have already speculated that the property will be used as a weekend retreat by Chelsea Clinton and her family. 9. 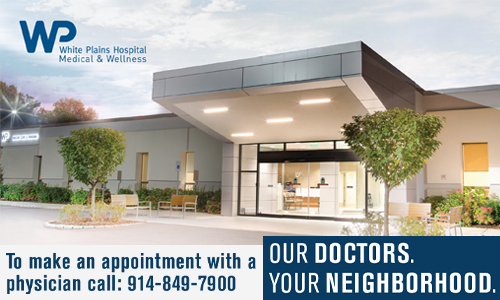 Creating a legacy in our town for years to come. 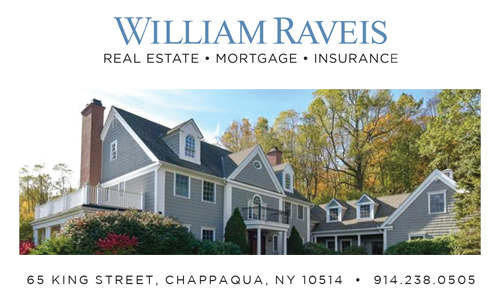 Williams noted that Chappaqua may well be the only town in the US that boasts two Presidents and a third Presidential candidate (Greeley). 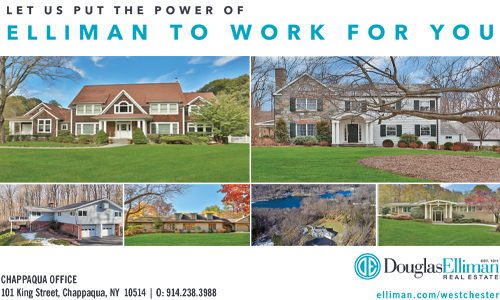 Although it is impossible to tell if the Clinton’s home will one day be a museum or if a statue of Hillary will be erected in downtown, “the bottom line for me is that, every bit as much as Horace Greeley became the signature historical hero of our town, I believe the Clintons are forever part of our past, present and future folklore, too. And in the best possible way, summed up Bennett. 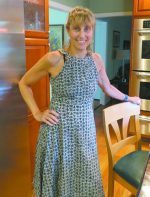 Stacey Pfeffer lives with her husband and three young children in Chappaqua. 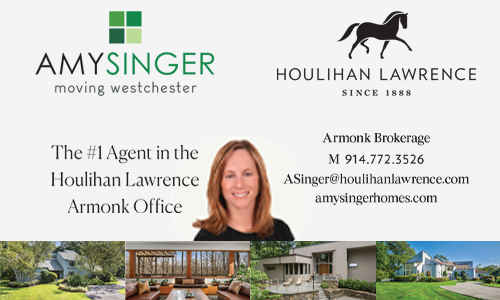 She has written for New York Family Magazine, Kveller.com, Westchester Parents and Inside Armonk. Attending the Democratic National Convention reminded me of my trips to Disney World. The choices were dizzying. Instead of deciding among different amusement rides, I had to choose which events to attend. The Women’s Caucus or the New York state delegation breakfast? LGBT karaoke, the Working Families Party or the Climate Hawks party (or sleep). It seemed that every hour there were multiple choices. Goofy shirts and Mickey Mouse ears are popular all over Disney world; the DNC featured a panoply of Hillary buttons, flag costumes and patriotic headgear (although these parallel universes merged when I saw a striking blonde lady dressed in a pale blue ball gown who looked remarkably like Elsa from Frozen). Both the DNC and Disney are sheltered bubbles. The outside world fades away; at the DNC, everyone around you is a Democrat with similar beliefs. Patriotism was palpable in Philadelphia. Speakers told us again and again that America is great, that the Democratic Party holds the key to the nation’s future success. For years, Democrats have been the party of negativity, cataloguing the countries’ woes from income inequality to racism to global warming. All these issues were mentioned, but sotto voce. The main message conveyed optimism in what Americans can achieve–just like Disney is the happiest place on earth. The crowds loved it. Their enthusiasm was electric. And then, there are the leading ladies. Disney has Belle and Ariel and Cinderella and Snow White. The DNC had Elizabeth Warren and Michelle Obama, Katy Perry and Meryl Streep, and the headliner: the presidential nominee, Hillary Clinton. Of course, Clinton defies the stereotype of a Disney princess. She doesn’t wear a sparkly dress or a tiara. She’s certainly not waiting around for a prince to save her. After all the balloons and confetti falls, reality awaits. After a Disney vacation, dirty streets and unpleasant service providers are jolting. After the thrill of a convention, the crassness of everyday politics is just as shocking. Not everyone is a Democrat anymore. As much as the convention was stagecraft, at its heart it is carrying out the promise of our Constitution, written 229 years ago. The peaceful change of power in a democracy. Our nation’s first black president passing the mantle of power to what could be our first woman president. That was historic. I shared that history with some Chappaqua residents who traveled to the convention–their stories are on these pages. 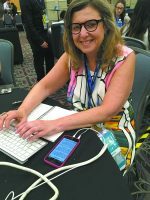 Susan Youngwood is a writer, editor and graphic designer who has been watching political conventions on television since 1972. 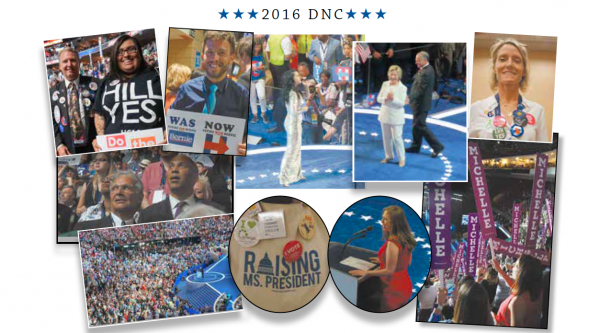 As the publisher of a hometown magazine for Hillary Clinton, and a life-long Democrat, I was proud to attend the Democratic National Convention as press. I was as excited as any friend, family or delegate visitor to Philly’s Wells Fargo Arena to witness first the all-star line-up of our nation’s Democrat Superstars throw their full weight squarely, and often, ever so eloquently into our hometown candidate’s corner. 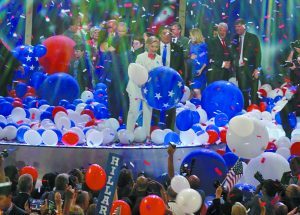 And then, of course, etched in my mind forever…witnessing Hillary Clinton make her way to the mic, waving to the crowds in every which direction, and fully embracing her historical nomination. I remember too: the abundance of heartfelt hugs–Hillary hugs. To me, they symbolize Hillary’s ubiquitous “Love Trumps Hate” campaign slogan…hugs for Bill, for Chelsea, for her running mate Tim Kaine, and on the night before, for and from President Obama. And countless other ones for those closest to her and seemingly always plenty to spare for her fans too. When hate gets thrown at her, Hillary Clinton doubles down on her capacity to tap into a bottomless reservoir of love–and hugs! And daily, inside the Philadelphia Convention Center: dozens of public service organizations promoted their missions via buttons, literature and animated conversation; at a daily breakfast briefing, caucuses and roundtables, open primarily to press and delegates, speakers delved into issues near and dear to their hearts. The general public attended rallies or packed “PoliticalFest,” a fun, interactive festival related to American history and politics. 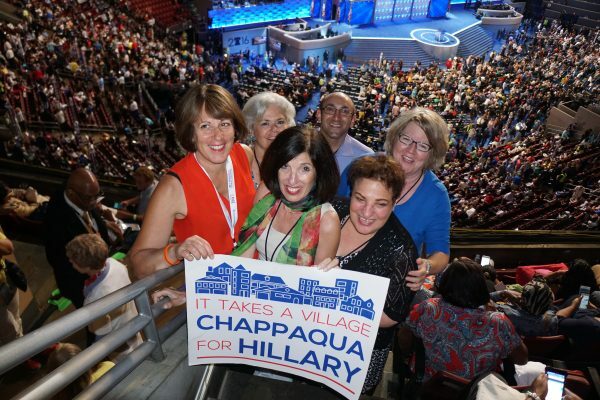 Hillary Clinton’s official nomination represents a huge historical milestone for Chappaqua too. I learned at one point that Hillary Clinton really appreciates the nights on the campaign trail when she can sleep in her own bed. So learning of a surprise celebration for her at the Kittle House on the very night following Roll Call in the arena was very touching; Chappaqua really is home, sweet home to Hillary. I was also glad to head to Philly with my long-time friend and former classmate at Columbia’s ‘J-school,’ Susan Youngwood, a self-described ‘political junkie.’ We were both first time press covering a political convention for either party. We independently mapped our days, posting in social media, writing, taking pictures and editing. We stayed in Cherry Hill, New Jersey, about 15 miles away in the lovely home of Joan and Barry Swirsky, old friends of Susan’s, gracious, helpful and excited-for-us hosts. Next, Susan reflects on her experience. From the outset, we agreed that we would focus much less on national-style coverage of the major speeches which our readers would turn to national media for. Instead, we set out to capture an eclectic array of stories that you might not see in other press, particularly anything that could qualify as having a local angle. About 40 women crammed into the living room of a townhouse in Philadelphia last week, taking up every imaginable seating and floor space. All were eager to learn an effective method for persuading undecided voters to support Democratic presidential nominee Hillary Clinton. Executive Women for Hillary is a national coalition of executive, entrepreneur and professional women who stand behind, support and advocate for Clinton to become the first woman president of the United States. It has about 1,450 members, all volunteer. “We think that using our skills, networks and influence on getting Hillary elected is a winning formula,” Evans said. They call their approach Winning Hearts and Minds. 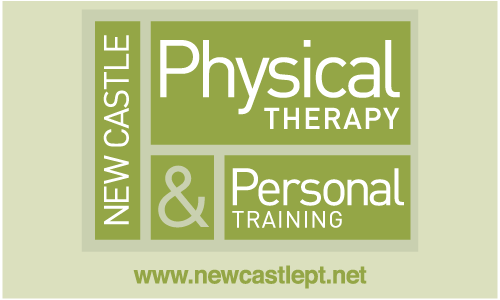 The group calls its training sessions salons, and they are usually held in someone’s private home. 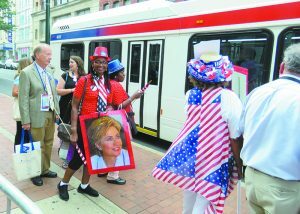 The one in Philadelphia during the Democratic National Convention was a typical gathering — it started with a social hour, as women chatted over cheese, crackers and cookies. After the group moved from the kitchen to the living room, the training began. The most likely response is either ambivalence or negativity. The next step is to ask the person to talk about his or her concerns — and the key is to listen. “Listening is not active,” instructed co-founder and national co-chair Jennifer Allyn, head of diversity for Price Waterhouse. “It’s curious, creative, collaborative.” Don’t interrupt, don’t disagree, don’t discuss their concerns one-by-one — just listen and be curious. “By asking those questions you are building a relationship – even if only for five minutes,” Evans said. Then, pivot–explain why you are supporting Hillary. And finally, ask them their concerns about Donald Trump. The goal is not to convince someone to love Hillary, but to get them to support her in November. “It’s a one-on-one game to get people to vote for Clinton,” said Evans. This method works, said women who used it effectively in the primaries. “I did this on my mother — who never voted Democrat in her life,” said Allyn. Allyn listened to her mother’s concerns, explained why she liked Hillary and was concerned about Trump, and convinced her mother to commit to vote for Clinton. “She even gave money!” Allyn added. 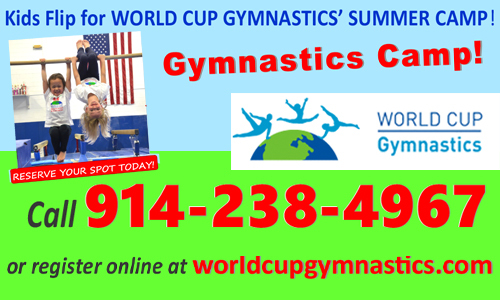 The training is concise, which is attractive to women busy holding down jobs and raising families. Women busy. It also works to women’s strengths. “The most important part is to listen,” she explained. 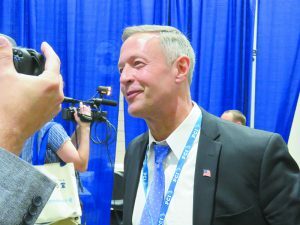 Twenty-eight members traveled to Philadelphia to attend the DNC, coming from around the country — Oklahoma, New Jersey, California, Washington, Virginia, to name a few places. The group plans to hold training salons in all 50 states (“We have a 50-state strategy,” Evans said), offer voter protection advice from its lawyer members, work on voter access and voter registration, and getting out the vote. It started with a single Facebook post, on April 12, 2015, the day Hillary Clinton announced her candidacy for president of the United States. 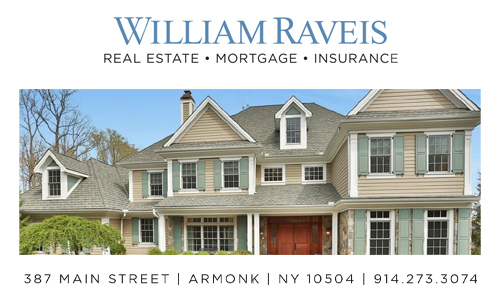 Dawn Evans Greenberg invited her friends in Chappaqua to join her for a drink to celebrate. A small group gathered, and decided they wanted to help the campaign. The group mushroomed, and now has 750 members ages 16 to 69. 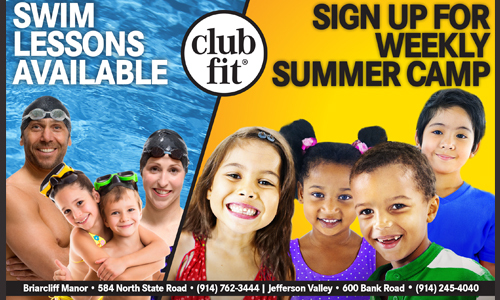 A satellite group in Rivertown has 200 participants. 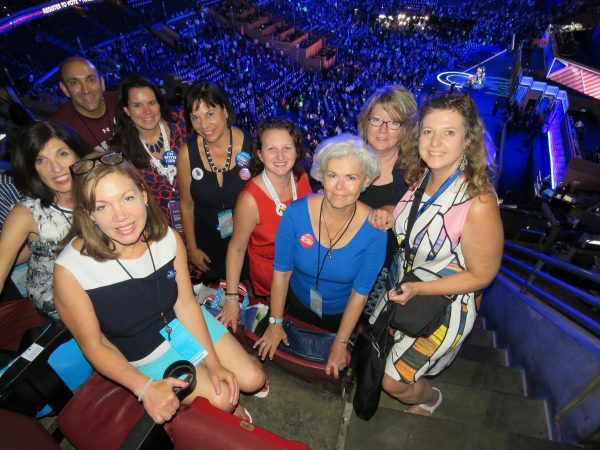 Fifteen months later, after hours of making phone calls, knocking on doors and registering voters, ten members of Chappaqua Friends of Hill and Tim (the name officially changed last week) attended the Democratic National Convention to watch Clinton accept the nomination. “Our enthusiasm carries us along,” said Greenberg. At the crack of dawn on Wednesday, the group set off to Philadelphia. Their first stop was a Women for Hillary Meet and Greet in the Philadelphia convention center, where they gathered buttons and encouragement. 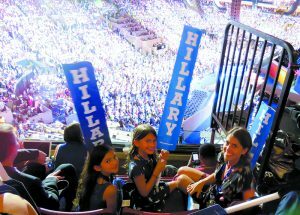 After getting their credentials (posing for a photo in front of the enormous Hillary button in the lobby) and checking into their accommodations, they headed to the Wells Fargo Center. Settled into their seats by 3:30, they were in for a long night. They were all pumped. This was their first political convention. “I’m still pinching myself,” said Kristen Lore, “I can’t believe I’m here. The members discussed their efforts and motivations while waiting for the program to begin. Iris Lauchaud listed all the states they called during the primaries: Indiana, California, Colorado, Connecticut, New Jersey, West Virginia. Randee Glazer, who worked on Wall Street but is now retired, found time to do it all — phone banking, canvassing, visibility, voter registration. “I like canvassing — I like speaking to people, telling them what I admire about Hillary. I think it really makes a difference,” she said. Jolted by 911, Glazer was motivated to volunteer after John Kerry’s loss in 2004. “After ‘04, I realized that I can not only vote — I have to do something.” She worked on the Obama campaign in 2008 and 2012. But this campaign has a more personal touch for her. Julie Gaughran fondly remembers her phone calls to southern states. “They had such lovely accents,” she said. Her first volunteer gig for a political campaign was in 1980, for Teddy Kennedy. “I’ve always been politically active,” she said. One thing that motivated them was the impressive skill set of the participants. They are “results-oriented” said one; this is not a group of ladies who lunch. 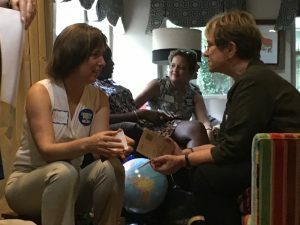 Beth Sauerhaft, who works in environmental and social sustainability, said Hillary’s strengths — her “amazing breadth and depth and … experience” inspired similarly situated people to volunteer. “We’re all a group of people with expert credentials,” she said. While all the members put in hours of hard work, they acknowledge their founder’s contribution. “Dawn is a force of nature,” said Gaughran. Eventually the convention began. There was a procession of speakers, both politicians and celebrities, some well known (New York City Mayor Bill de Blasio and Star Jones), some not as well known. Audience members flicked through their Facebook feeds, took photos, explored the convention center. The mood shifted at 8 p.m., when gun violence took center stage. The audience quieted down. Phones turned dark. All eyes turned to the stage as Christine Leinonen, the mother of a victim of the June 12 Pulse nightclub shooting in Orlando, took the microphone. Leinonen said that when she went into labor with her son, she was a Michigan state trooper and the hospital stored her gun in a safe. Glazer rested her cheek on her hand, transfixed. All around, eyes twinkled with tears. But no words could really capture their feelings when Obama took the stage. Witnessing this live was indescribably different from seeing it on television. “You just feel the hum in the air,” said Sauerhaft. “You could feel the hope in the air,” said Greenberg.